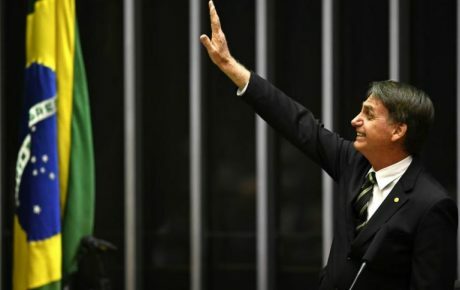 On January 1st, Jair Bolsonaro will take office as Brazil’s 38th president. 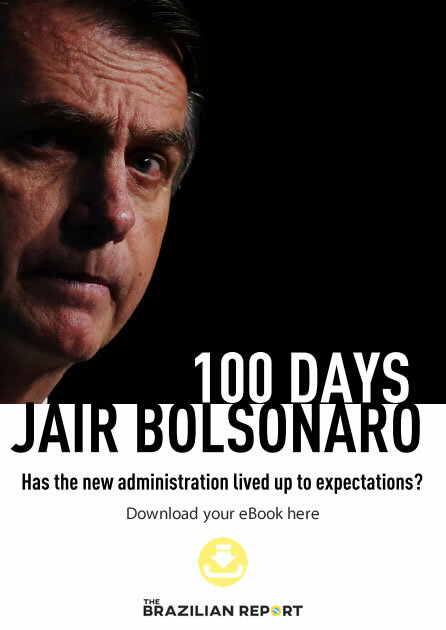 He will do so on a platform chock full of brash and heavy-handed social policies, yet one underpinned by ultraliberal economics and the vesting of extensive power into the hands of economist Paulo Guedes, a University of Chicago graduate. In 1973, General Augusto Pinochet seized power in Chile after a military coup. While imposing his brutal regime on the Chilean people, General Pinochet also handed the reins of the country’s economy to a group of economists, fresh off the plane from the very same University of Chicago. While there are plenty of caveats, the comparisons between the two are too close to resist. The foundations for Chile’s economic experiment date back to 1950s U.S. and the establishment of a school of American economic liberalism within the University of Chicago. Led by Milton Friedman and George Stigler (both of whom would later go on to win the Nobel Prize in Economics), the Chicago School became known around the world as the hub of liberal economic thought. Opposed to the state intervention of the New Deal and Marshall Plan, the group’s economic theory was based on the maxim that when left to its own devices (read, without any intervention from the state), the market would take care of itself. 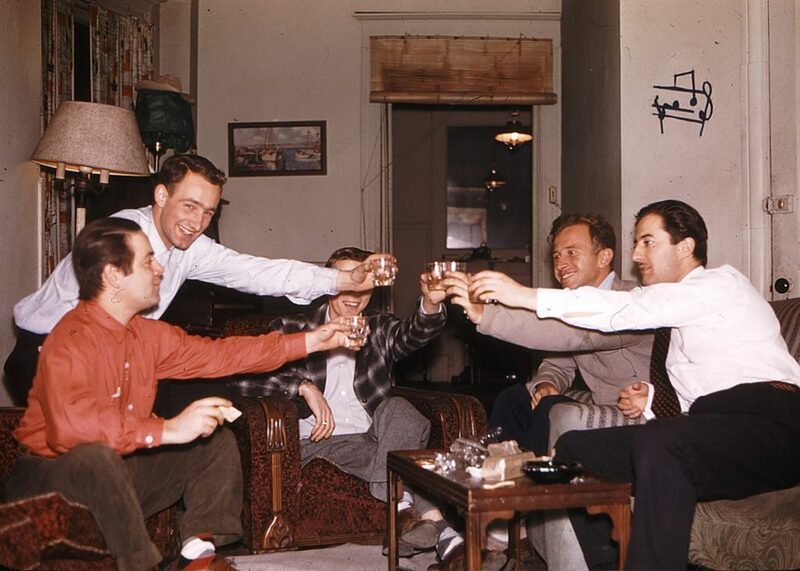 Chicago Boys circa 1957, left to right: Luis Arturo Fuenzalida, Alberto Valdés, Larry Sjaastad, Pedro Jeftanovic, and Sergio de Castro. Meanwhile, afraid of the spread of communism throughout Latin America, the U.S. State Department organized the “Chile Project,” funded by the Ford Foundation, which sponsored economics students from Santiago institutions Universidad Católica and Universidad de Chile to go abroad and study in Chicago. On their return, these Chilean students became known as the Chicago Boys, stepping off the plane in Santiago with brains full of liberal economic theory and carrying “El Ladrillo,” (The Brick) their economic manifesto for their home country, so named because of its unreasonable size. In 1970, socialist Salvador Allende was elected president of Chile. Already nervous about a red tide south of its borders, U.S. president Richard Nixon told his advisors to “make the economy scream,” in order to prevent Allende taking office or remaining there for very long. On September 11, 1973, a U.S.-backed coup, led by Chilean army general Augusto Pinochet, seized control of the country. Allende was killed during the putsch, with the official records showing he committed suicide. With the socialist government out of power, the Chicago Boys approached the Army and handed them The Brick. They were then put in charge of the country’s economy. Without opposition or democracy, and given full autonomy to work, Chile was a blank canvas for the Chicago Boys to do whatever they pleased. Price controls and import barriers were removed, the oil industry and other state-owned businesses were sold off, and spending was cut left, right, and center. The immediate impact of the liberal experiment in Chile was a profound recession. In 1975 alone, the country’s GDP fell 12.82 percent and unemployment shot up 6.5 percent. Milton Friedman himself flew to Chile, famously proclaiming the country required “shock treatment” in order to transition to a free-market economy. The economy began improving in what was called the “Miracle of Chile,” seen as something of a dress rehearsal for Margaret Thatcher and Ronald Reagan’s governments in the UK and U.S. In 1981, after six years of growth, Chilean GDP reached USD 62.9 billion. All the while, Chile lived under the brutal dictatorship of General Pinochet, a regime which killed thousands of opponents and tortured ten times more. The Chicago School thinkers downplayed the violence, conceding that it was the price to pay in order to implant sweeping liberal economic policies. 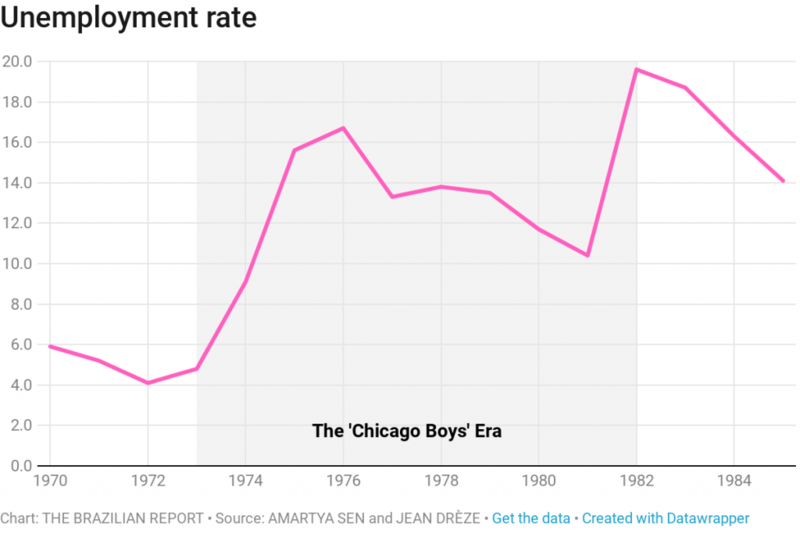 While reportedly reticent towards the Chicago Boys themselves, General Pinochet put up with them for many years, until their policies caused a second recession, the so-called Crisis of 82. Only seven years after its last economic disaster, the country’s GDP fell over 11 percent in 1982 and unemployment rocketed 9.2 percent, to the point that just under one-fifth of the population was left without work. General Pinochet fired the Chicago Boys and turned away from liberal economics, deciding to nationalize some of Chile’s largest banks. 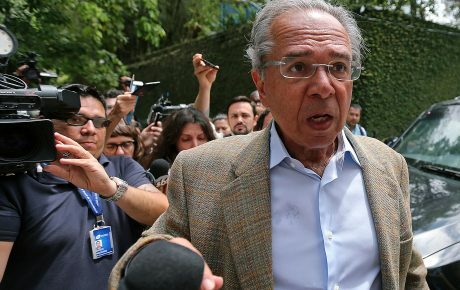 Forty-five years on from the coup d’état in Chile, Brazil is set to hand the reins of its economy to Paulo Guedes—the country’s very own University of Chicago graduate. 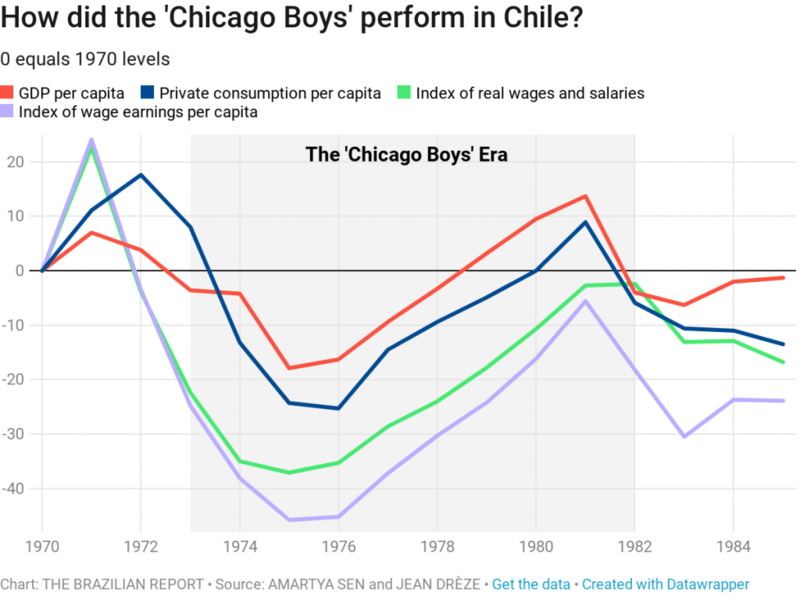 Though not strictly speaking a “Chicago Boy,” Mr. Guedes followed the same path as Sergio de Castro, Emilio Sanfuentes, Pablo Baraona and the other Chilean economists who called the shots in General Pinochet’s economy between 1973 and 1982. Paulo Guedes moved to the U.S. in 1974, pursuing a Ph.D. at the University of Chicago. Upon returning to South America, he was invited by General Pinochet’s finance minister Jorge Selume (another Chicago graduate) to teach at the Universidad de Chile—at the time controlled by the military. Today, Mr. Guedes is standoffish about his time working under General Pinochet’s dictatorship, claiming in an interview with Revista Piauí that he “knew nothing about the political regime,” and that “it was irrelevant from an intellectual standpoint.” He returned to Brazil after catching agents from Chile’s secret police searching his apartment. However, Mr. Guedes obviously feels an affinity towards the Chicago Boys. Earlier this year, he told the Financial Times he plans to implant a “Pinochet-style” solution in Brazil, claiming “the Chicago Boys saved Chile,” despite leaving the country significantly worse off than when they took control. 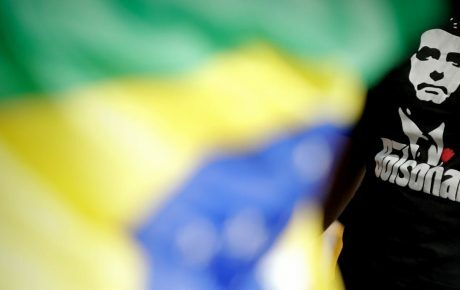 With echoes of General Pinochet, Jair Bolsonaro is set to hand over complete authority on Brazil’s economy to Paulo Guedes — putting him in charge of a “super-ministry” of the economy, merging the Ministries of Finance, Planning, Budget and Management, and Development, Industry, and Foreign Commerce. Mr. Guedes has also recruited a gang of fellow Chicago alumni to assist him: Rubem Novaes will preside over Banco do Brasil; Roberto Castello Branco will lead Petrobras, and Joaquim Levy—who was briefly the Finance Minister of ousted Workers’ Party president Dilma Rousseff—will take charge of Brazil’s development bank. 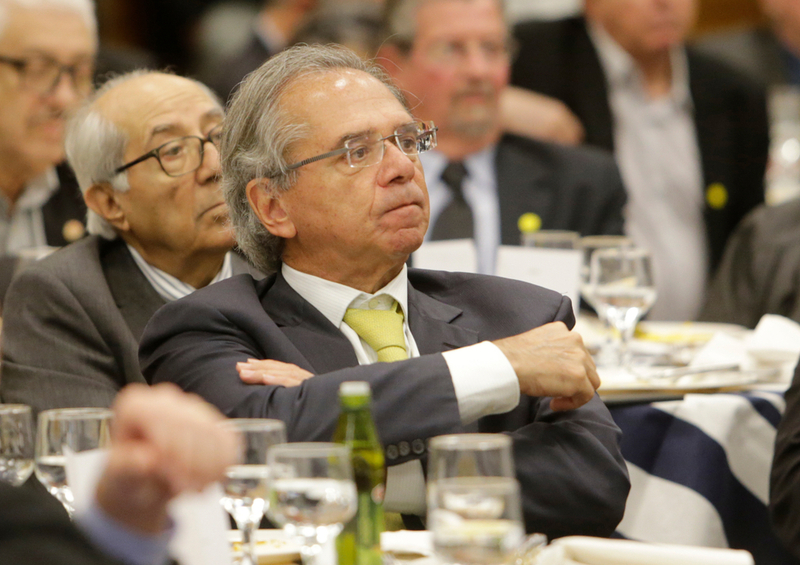 Paulo Guedes’ economic agenda follows the basic tenets of American liberal economics and shows many similarities with the measures implemented in Chile. A fierce proponent of privatizations, he intends to sell off state assets, restrict spending, and transform the country’s pension system to copy the model used in Chile. The Chilean pensions model has been the subject of huge popular dissatisfaction in recent years, with these individual savings accounts not producing returns sizeable enough for retired persons to live on. The average pensioner in Chile is today receiving less than minimum wage. According to Mr. Campante, if Brazil was to make such a dramatic switch in its pensions system, the transition period will hit the country hard. 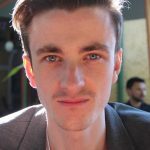 “When you move to a private pension model, current workers no longer contribute to the pensions of current retirees, but they also don’t have their individual pensions accounts because they worked under the old system,” he explains. Funding the pensions of current workers would invariably result in an increase of the public debt. “The devil is in the details, and these details are particularly troubling in the case of Brazil,” he adds. From the outside, today’s Brazil seems like a match made in Friedmanite heaven. A strong-handed government is about to take office, backed by the Armed Forces and with a cabinet littered with military men. Meanwhile, ultra-liberal economists are about to be given free rein over the economy. However, Brazil is not the tabula rasa the Chicago Boys came across in Chile, it is more like a tabula inscripta, a country where negotiations and concessions are the norm, with 27 states, over 5,500 municipalities, and 35 political parties to keep happy. 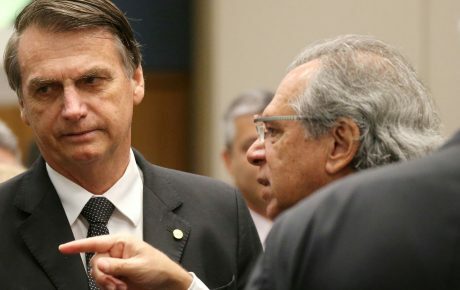 “[Implanting Guedes’ economic agenda] will be very unpopular and would demand a level of political articulation which the future government doesn’t seem to possess,” says João Carlos Magalhães, a Ph.D researcher at the London School of Economics. Mr. Magalhães wonders if Brazil might then take a leaf out of Chile’s book, deciding that their plan of Pinochet-style liberal shock therapy will not pass in a democracy, subsequently heading down the path towards authoritarianism.